THE FILM PATROL: 'First Man': Neil Armstrong as the Last Roman? 'First Man': Neil Armstrong as the Last Roman? 'First Man': ENOUGH WITH THE STARING. Who am I to argue with an Oscar-winning director? My usual little old miscreant self. This two-and-a-half-hour epic on the life of the colorless yet accomplished Everyman, astronaut Neil Armstrong, the first man to walk on the moon, feels longer. With the best intentions, the result is a faithful, plodding hagiography of a secular saint, a modern man of steel with a heart of sentimental mush. It’s a Gary Cooper movie. Given the chance to watch it from the front row of the theater, a mistake I haven’t made since Raging Bull, it was odd to see the film as the epic it was touted to be. It seemed as though most of the action consisted of talking heads and reaction shots, much more of a TV aesthetic. Lots and lots of close-ups. Neil Armstrong staring and staring and staring . . . until finally I felt like the subject of an unsuccessful hypnotist. Of course, the subject cries out for film treatment. I am a child of the Space Age, and “our” astronauts were the ultimate heroes and role models. We drank Tang, a sugar and-orange-flavored-and-colored powder, because “the astronauts drank it.” We ate Space Food Sticks. As is always the case with a movie that wants to be taken as gospel, the makers of First Man got a lot of ink about their attention to period detail. I was born in 1960, the same year as the daughter Armstrong and his wife lost to a tumor only two years later, an event which haunts his character in flashback throughout the film. I can testify that, visually, they nailed the period details. However, at the heart of the film is a lie so maudlin that it clanks like a cowbell. Armstrong is aptly played by the most Sphinxlike actor in Hollywood today, Ryan Gosling, a performer so enigmatic he makes Garbo look like Jerry Lewis. Gosling and Chazelle hit paydirt with La La Land, a Minnelli-esque musical-tragedy pastiche. 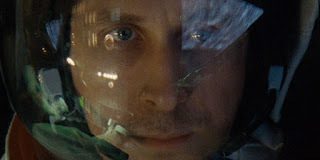 Now First Man weighs in like the second film in a trilogy about the travails of white people, a movie that insists that momentous occasions in history are always laden with emotional freight, that resurrects the strong, silent type and valorizes it (if only everyone would just leave Neil alone everything would be fine!). It’s as if Chazelle’s Armstrong is the Last Roman, the final and ultimate noble incarnation of American goodness. He is a closed-mouthed knight in civilian clothes. Neil Armstrong was a regular guy, albeit intensely intelligent and focused. In the words of Hollywood, he had no redemptive arc. He did his job, lived his life, and was a very private man. He shunned the spotlight. So, how do you make a movie about him? Now, I’m sure that he was devastated and affected by his daughter’s early death. It gives the title character an emotional hook, something with which to work. So (SPOILER ALERT) they threw in the bit near the end of the film about him throwing his dead daughter’s bracelet into a crater on the Moon and crying. It rings hollow because it’s so shamelessly speculative, or as I’m sure it was pitched, “emotionally true” if not something Neil Armstrong would ever do. It gives the lead character an emotional center and weight, it gives closure; it ties the story together. And we slaughter truth on the altar of the cheap epiphany. Meanwhile, this 12 Years a Caucasian plods on. And what was so great about being repressed, anyway? The marriage of Neil and Janet Armstrong is presented as being typical of the time — everyone lodged in their traditional roles, not communicating. This is misrepresented in the film as the kind of Stoicism that made America great, not as the kind of problem that led to huge numbers of couples getting divorced, from the ‘70s on (including the Armstrongs). So strip away the false, and what do you have? Another paean to man’s ingenuity, with the usual pumped-up special-effects sequences you might expect. The real story of the mission to the Moon isn’t a stirring, romantic adventure. It was accumulation of tiny moments, of the contributions of thousands, coordinated and assembled with audacious frenzy. That’s a story worth filming. That was Hidden Figures.